In the 1900 census, items of particular interest to family historians include the number of years a couple has been married and, for women, the number of children born to her and the number living at the time. 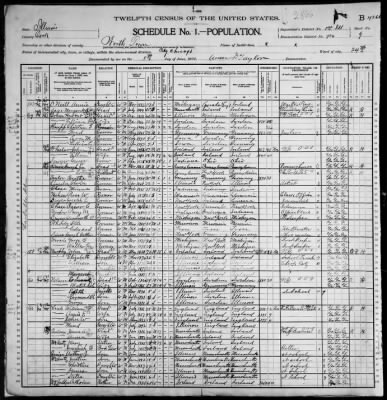 This census was officially taken on June 1, 1900. In addition to names, addresses, and relationships to the heads of families, it also includes birthplaces of those listed and their parents, year of immigration if foreign-born and whether naturalized, occupation, and if they lived on a farm.